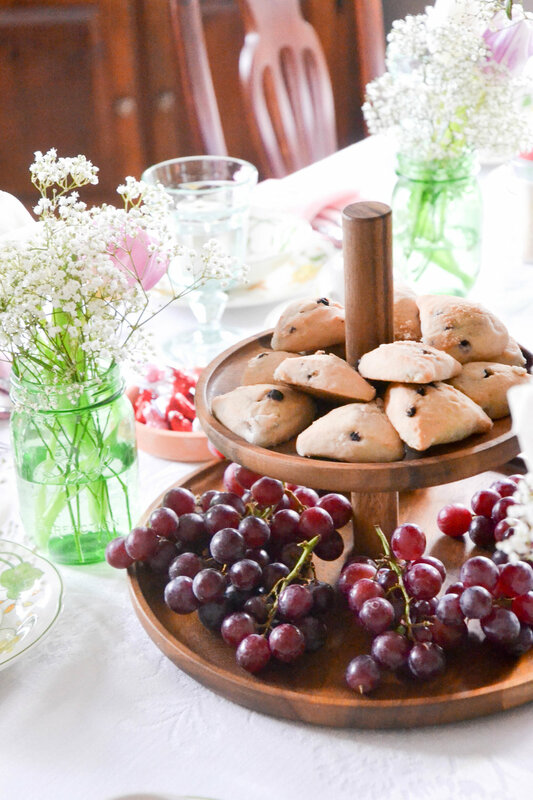 This past weekend, my mom and I hosted a bridal tea party for all of my bridesmaids! Since my bridal party is small, and some of them had never met, we figured it would be the perfect occasion to get together, meet, and enjoy some mimosas and tea. With the vision mostly from my mom, we styled this green & pink themed tea party. 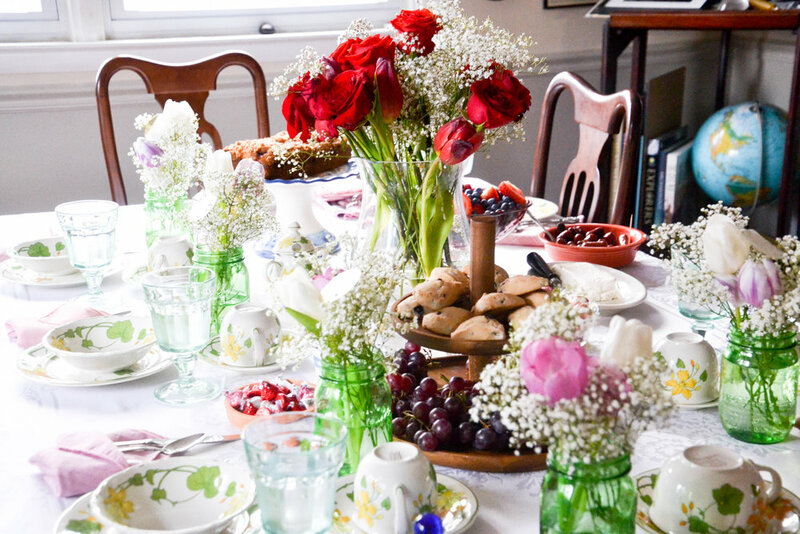 Characterized by heaps of baby's breath, delicate floral tea sets, and light delicacies, we decided our theme was a mix between Victorian/English tea and modern, mismatched whimsy. 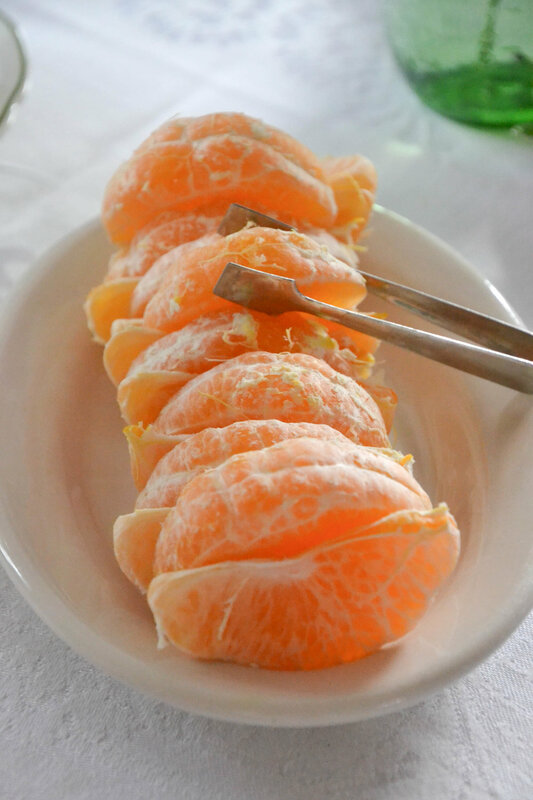 My mom pulled out all of the stops to create a menu that was just as light and refreshing as it was delicious. 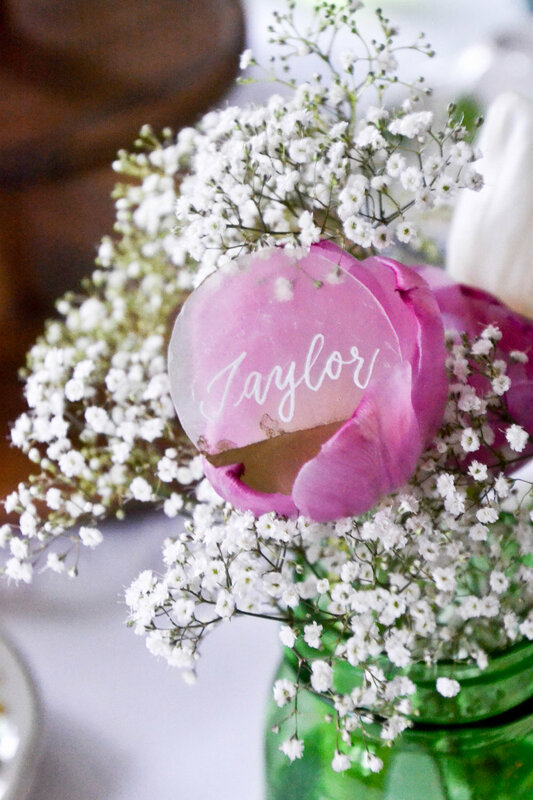 To add a bit of calligraphy to the mix, I decided to make place cards for the table. I went with something that felt dainty, almost fragile: shells. Even though shells feel a bit seasonal and restricted to the summer time, I was inspired by the sheer translucence of capiz shells. I added a strip of gold to the bottom of the shell using metallic spray paint - next time I would use fine-tec as I was not thrilled with the smudgy results - but the bleed proof white ink looked AWESOME with the scratchy, sheer texture of the shell. We stuck the shells in bountiful clumps of baby's breath (leftover from Valentine's - woo for multi purposing!) in pretty green mason jars and tulips. In quantity, this definitely MADE the table! Our menu was light and, if you can imagine, feminine. We had fresh fruit, pastries, scones, blueberry bread, smoky links, oatmeal with brown sugar and craisins, and small omelette burritos. Of course, there was plentiful tea - including loose teas and herbal teas - which was one of my favorite aspects. Nothing says leisure and luxury more to me than steeping loose tea. In all, our bridal tea party was a huge hit and I am so thankful to have such creative people around me to make such a beautiful event. I can't wait for all that is to come!